All the nuances of spoken word. Thrilling musicality. No other headset mic comes close. Until the end of July 2015, get €75 (£50) when you upgrade your old headset mic to a new DPA d:fine™ headset microphone. There’s never been a better reason to try out the DPA d:fine™ Headset Mic’s superior fidelity, exquisite comfort and discreet design for yourself. DPA d:fine Headsets make connectivity easy with their extensive range of adapters allowing you to pair the d:fine range with all professional wireless systems. This offer is only available from Rea Sound, Big Bear Sound and Reynolds of Raphoe. Simply fill in the form below, print out the email you receive in confirmation and simply take or send the printout and your old headset microphone, no matter what make or model, back to one of our authorised DPA dealers. You will receive £50 (75€ in the Rep. of Ireland) ex. 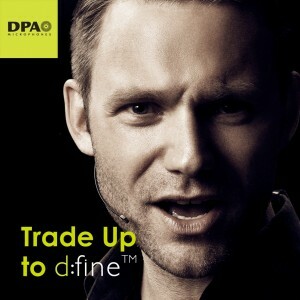 VAT off the price of your new DPA d:fine™ Headset Microphone. You must fill in this claim form to be eligible for this offer, which is valid for all DPA d:fine headset microphone purchases made between the 1st July and the 31st of July 2015.